How can I still use my fax machines? What about my Polycom Sound Station (or other analog conference phone)? And the most common of them all…. How do you do paging with OCS??? In this series of posts I’m going to offer up a number of suggestions to make analog devices work with OCS environments, and even run through the setup of one such device to make it all come together. In most cases the customer already has a T1 (or more than 1) for their existing PBX, and they likely have made a significant investment in conference room equipment, paging systems and or fax machines. As part of the deployment it is our job to make these existing devices function as they did before OCS was installed. Customer has an existing T1 based infrastructure and will be using a gateway to convert the T1s over to VoIP. Depending on the gateway selected we may be able to add in FXS ports on the gateway itself, a number of devices support mixing T1 and analog ports in the same chassis including the NET UX series (coming soon) and the Audio Codes Mediant series. If the gateway doesn’t support analog ports or you don’t have room to expand, you can always buy a small gateway such as the NET Tenor (the one we’ll cover in this series) and configure the existing gateway to route over IP to the new gateway (this is also good for scenario #2). With a few simple routes added on our main gateway, we can now send and receive calls with the analog devices. There are a number of different types of paging systems so what we’ll discuss here can’t cover them all. However, the theories discussed in this section should cover analog systems that are most likely already in place. The key thing to remember when planning for analog paging is it will just be another extension in the gateway. Whether you have a multi-zone system or a single zone, the paging system will typically have an analog based input system with an RCA or RJ11 receptacle that can be run from an FXS port (check with your paging vendor if you’re not sure). If it doesn’t have this functionality built in, a small module such as a Valcom V—9970 can be purchased to add it on. 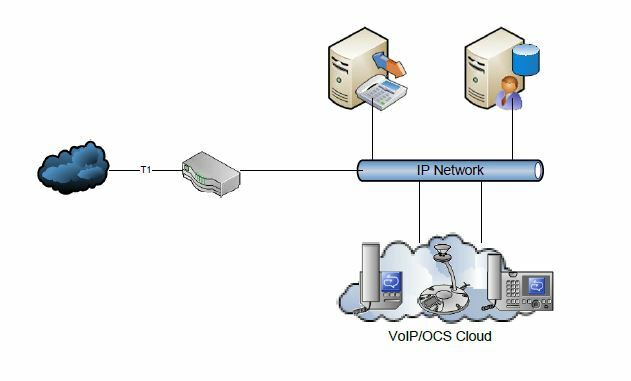 All you really need to do is connect the paging system to one of your FXS ports (directly or through the module) and assign an extension or phone number to the port. Once this is done in OCS you will want to create a route for this extension (if your default route doesn’t route it). Then users need only to dial the number you assigned to the paging system and make their announcement. You can block access to this through policies in OCS or at the gateway if you’d like as well. 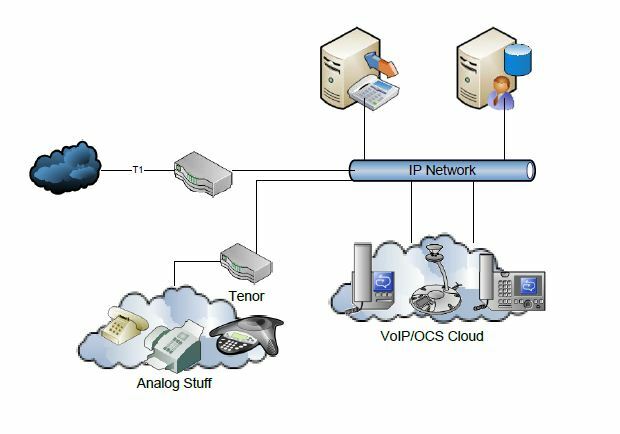 Using IP to FXS gateways allows us to connect our existing analog devices to OCS, and give us additional flexibility for routing office to office communications via the WAN. 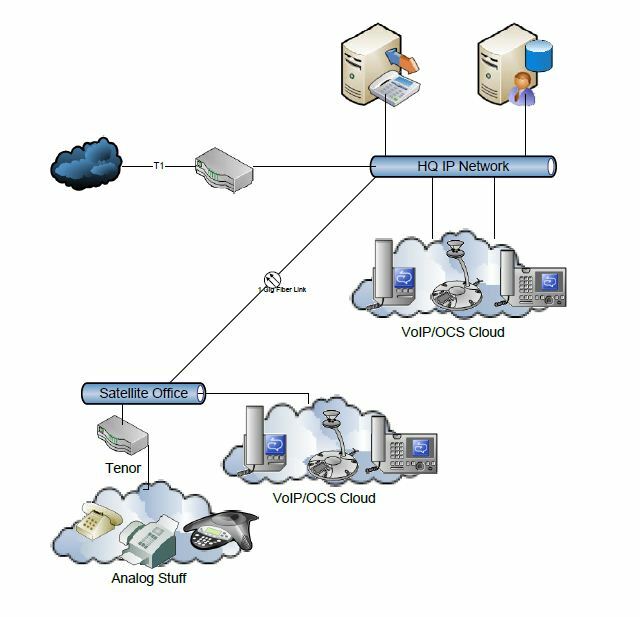 Check back shortly for the second post on this topic where we will go over the configuration required to make our NET Tenor FXS gateway work. This entry was posted in Uncategorized and tagged OCS 2007 R2, OCS Analog Devices, OCS as a PBX, OCS Faxing, OCS Paging. Bookmark the permalink.